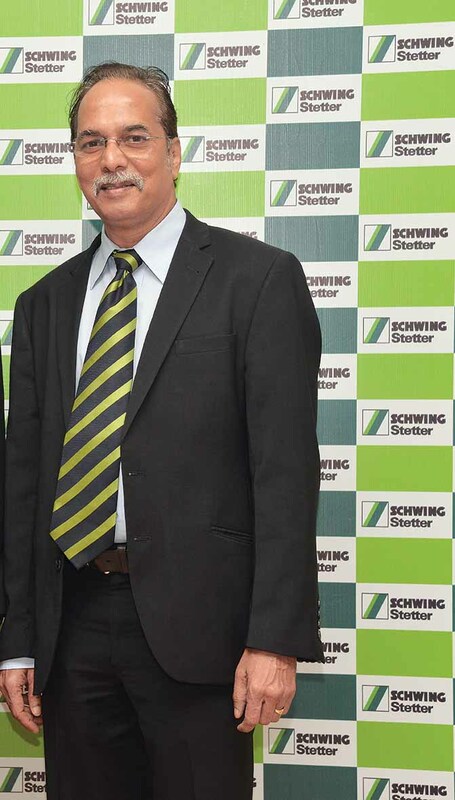 Schwing Stetter India has introduced four new mobile concrete mixers in association with Mahindra Powerol. One of the leading manufacturers of transit concrete mixers, Schwing Stetter, in association with Mahindra Powerol has introduced four new transit concrete mixers under the ‘Super Six’ theme. These are premium machines that leverage the Internet of Things (IoT) to assure operators of higher efficiency and productivity. Of the four machines the company has introduced, two are dubbed as ‘Super Six IoT In’ and ‘Super Six IoT Ready’ each. The other two are dubbed as ‘Super Six GPS’ and ‘Super Six Standard’ each. 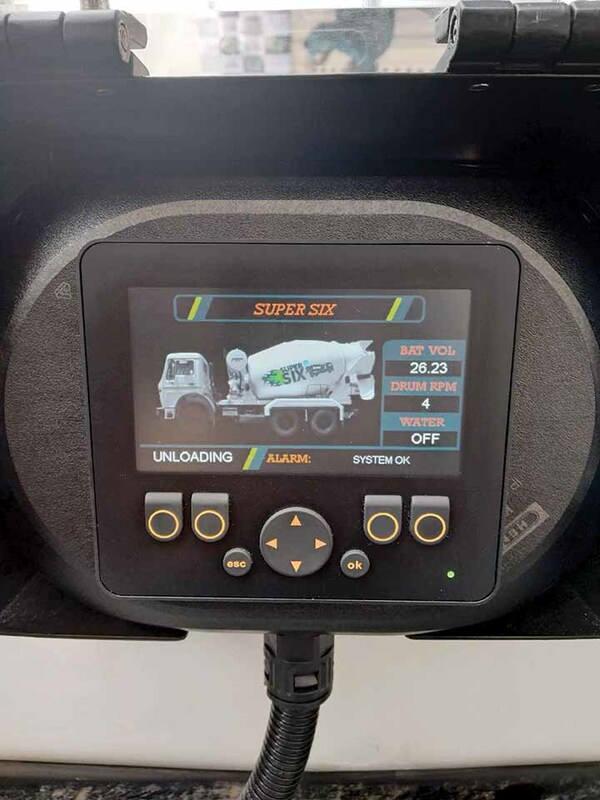 The ‘Super Six IoT In’ and ‘Super Six IoT Ready’ measure six-cubic metre in size each as far as the concrete mixer is concerned. Both are powered by the truck’s engine through a power take-off. The ‘Super Six GPS’ and ‘Super Six Standard’ also measure six-cubic metre in size each as far as the concrete mixer is concerned. 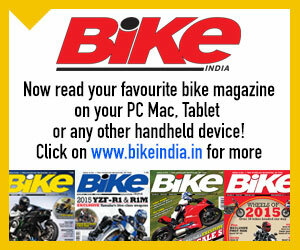 Both the models are powered by a slave engine of Mahindra make. Aiming at a market that is estimated to be 8000 units strong, the four ‘Super Six’ models could be had on 6×4 truck chassis of various CV manufacturers. 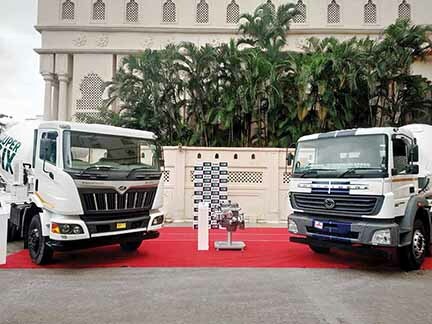 Hoping to command roughly 80 per cent of the six-cubic metre transit concrete market by clocking in the region of 6000 units, Schwing Stetter has priced the ‘Standard’ variant at Rs.7.15 lakh; the ‘GPS’ version at Rs.7.65 lakh; the ‘IoT Ready’ version at Rs.7.95 lakh, and the ‘IoT In’ version at Rs.8.15 lakh exclusive of GST. 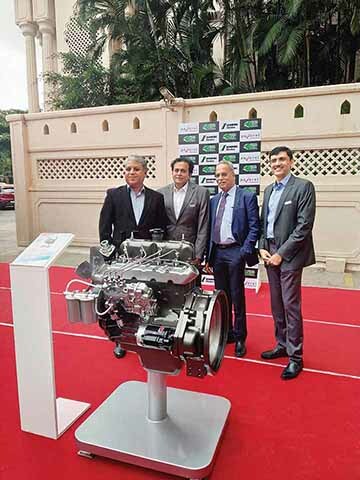 The association with Mahindra Powerol presenting Schwing Stetter with an advantage of fuel-efficient engines that are also BSVI emission compliant. In what is claimed to be an industry first initiative, the association of Mahindra Powerol and Schwing Stetter has also provided the concrete mixer specialist with machines that address the exacting needs of the market; of the customers. 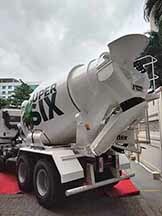 With Government applying much thrust on infrastructure development, the ‘Super Six’ transit concrete mixers are said to have come at the right time. A result of rigorous trials according to Schwing Stetter sources, the ‘Super Six’ machines mark a shift away from ‘analogue’ concrete mixers, which called for near constant supervision and control. 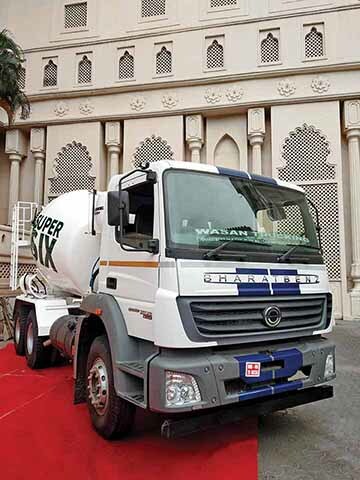 Announcing the arrival of smart, premium and intelligent products as far as transit concrete mixers are concerned, the ‘Super Six’, according to Anand Sundaresan, Vice-Chairman and Managing Director, Schwing Stetter India, boasts of higher fuel efficiency, lower cost of ownership and various value additions. “The IoT enabled smart truck mixers that we have introduced, will provide higher value to our customers,” he mentioned. Pointing at the ‘IoT In’ transit mixer, that is the most feature-packed of the four models introduced, Sundaresan averred, that the data collected will be transferred to a cloud server using a SIM card through IoT compliant hardware fitted to the mixer. Apart from providing the operator access to (protected) data (live machine status as well as historical data) from remote locations using a laptop, mobile or a tab, the ‘IoT In’ machine reduces downtime by enabling proactive maintenance and an ability to remotely monitor the operation. The integration of GPS for live tracking provides data analytics to monitor machine efficiency, productivity and traceability. The ‘IoT Ready’ machine has a CAN-based controller with a multi-colour display. The display is placed behind the cabin and ahead of the mixer drum. Eliminating the need for conventional dials, the display provides information on battery and drum parameters like hours of operation, number of drum rotations in CW and CCW directions, and radiator running hours. The display also shows critical alarm messages. 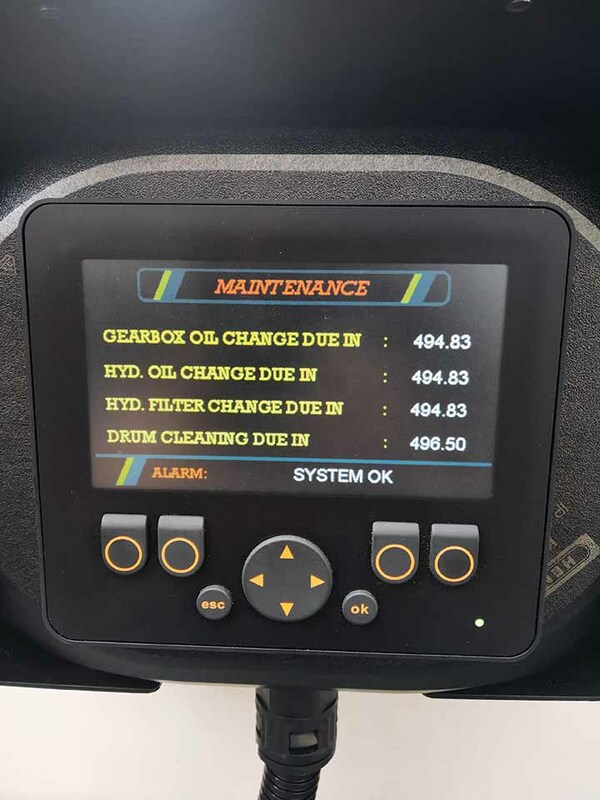 The ‘IoT Ready’ machine facilitates maintenance scheduling like gearbox oil change, hydraulic oil and filter change, and drum cleaning. Enabling IoT integration for data analytics as an option, the ‘IoT Ready’ machine, as part of the ‘Super Six’, offers large loading volume, optimum drive characteristics, a best-in-class spiral geometry, larger clearance for concrete discharge, ease of cleaning, best-in-class fuel efficiency. If these characteristics result in low lifecycle costs, the ‘Super Six’ stand out for Stetter T-protect wear protection, and are expected to offer a high resale value. Said to offer cost savings to the tune of Rupees-five lakh over a period of five years, the ‘Super Six’ machines are claimed to be future ready too. A range of options, the ‘Super Six’ machines could be had with, include a regulator for concrete discharge, water meter, admixture system in gravity version, admixture system in compressed-air version, slump meter, and a hinged part (made of plastic). The company also offers a 3/4 flap drum cover, a full flap drum cover, plastic extension chute, and a swivel feed hopper. Informed Sundaresan, “It was in 2013 that we first partnered with Mahindra Powerol. It marked a big step ahead for us then, and is the case today.” Designed at Mahindra Research Valley, the engines are designed to address the application duty cycle to the tee. Powered by the Mahindra Powerol slave engine, the ‘Super Six GPS’ and ‘Super Six Standard’ range promises superior fuel savings. The 2.8-litre four-cylinder BSVI-CEV Mahindra Powerol engine is claimed to be very efficient, powerful and clean. A typical consumption cycle in this class of concrete mixers is 1.8-litre per hour. The Mahindra Powerol slave engine consumes 1.1-litre fuel per hour in comparison according to Schwing Stetter sources. This, they said, was observed in a 2000 hour test run against an engine from a competitor. The cycle typically includes standard loading, inspection, transit and unloading at the factory and field level. With both the companies looking for a long association, the ‘Super Six’ machines stand to profit from the know-how and expertise of either company in their domain. Providing an opportunity to both the companies to offer the best to their customers, the ‘Super Six’ machines, with IoT, are set to facilitate the availability of crucial statistics on performance and efficiency. Explained Sundaresan, that they selected the Mahindra Powerol engines only after bulk proto testing them pan-India. He informed that the engines clocked more than 10 lakh hours across applications. Stating that the segment the ‘Super Six’ machines are in is growing at a high pace, Sundaresan revealed that they are banking on the government’s move to cut GST on construction equipment from 28 per cent to 18 per cent, and the need to invest over Rs.59 trillion in infrastructure development by 2022. Contributing to the unprecedented high growth rate the construction equipment and earthmoving industry is experiencing to the cut in GST rates, Sundaresan said, “The volumes that took one year to achieve are now being achieved in a span of six months.” Schwing Stetter he said, manufactures an estimated 250 concrete pumps a month, and an estimated 450 truck mixers per month. The truck mixers range from three cubic metres to 12 cubic metres. With the ‘Super Six’ machines providing an opportunity to define the future of transit concrete mixers, Schwing Stetter, according to Sundaresan, is looking at leveraging technology to offer best-in-class products in India. It is also looking at how technology is helping to address market requirements as well as the upcoming regulatory changes. With Construction Equipment set to move to BSIV emission norms by 2020, Sundaresan is hoping that his company’s partnership with Mahindra Powerol will prove to be highly beneficial for either. With the market size expected to rise beyond 10,000 units in a span of two years, Schwing Stetter is operating at close to 100 per cent. A new facility is being built near Kanchipuram with an investment of Rs.250 crore earmarked for Phase-one. When the new facility goes on stream and rolls out new products that are smarter, more efficient and offer superior productivity, the association between Mahindra Powerol and Schwing Stetter would have reached a new level. 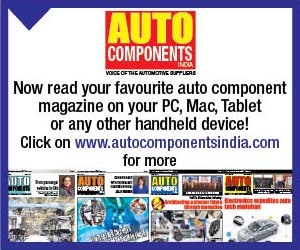 Expressed Nijhawan, that they have a network of 140 dealers. “The fact that we have increased the extended warranty on the engines from 1200 hours to 2000 hours should reflect on the confidence we have in our products,” he mentioned. Q. What are Schwing Stetter and Mahindra Powerol bringing to the table as part of the partnership? A. The partnership between Schwing Stetter and Mahindra Powerol for the Super Six concrete truck mixer range will be of advantage to the customers. The 2730 cc, four-cylinder, BSIV-CEV MD 575 engine from Mahindra is fuel efficient, environmentally friendly and the Internet of Things (IoT) compliant. It is ‘Made in India’. As an IoT compliant engine, consumers stand to benefit from a heap of statistical data on engine performance. 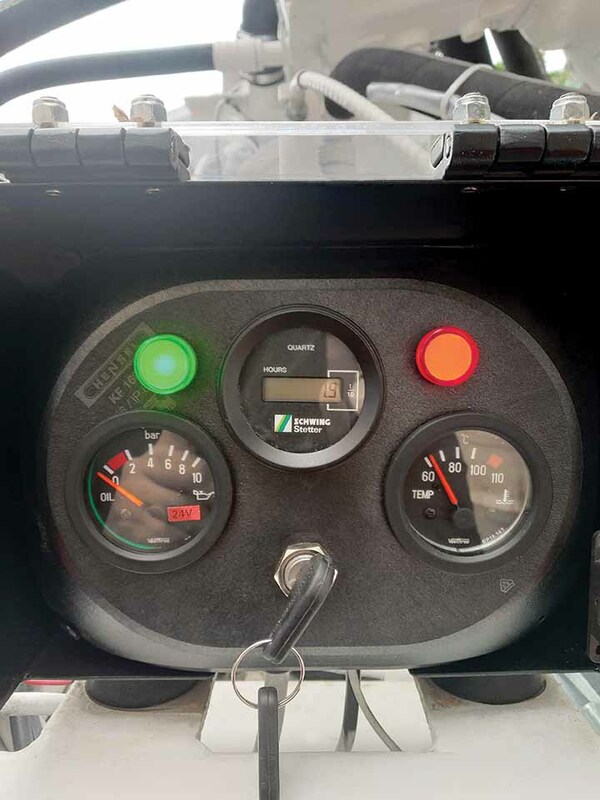 The onboard GPS capability would enable customers to track their concrete mixer in transit for route optimisation; to trace pilferage, and better manage the operations on the whole. The rise in overall efficiency will help the customer to bring down the total cost of ownership. Net return on investment will go up. Q. What led to the selection of BSIV-CEV MD 575 engine from Mahindra Powerol? A. We conducted a survey of customers in the (transit concrete mixer) segment. We have introduced a number of variants over the last 18 years to address the needs of the segment. From the ease of concrete loading and unloading, faster ingress and egress of material, to improving the quality of steel to ensure less wear of the drum and other components. 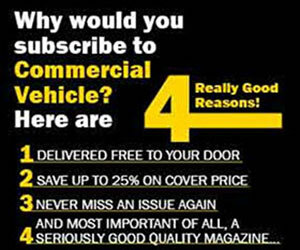 The survey revealed that customers were looking for an improvement in fuel efficiency. With fuel prices rising month after month, the customers were looking at ways to tackle the challenge. We engaged with some customers in a fixed-price contract of two and three years duration. We felt it necessary to protect their interests. When we saw that Mahindra had an engine that was being used in tractors, we started discussing with them, if it could help us bring down the fuel consumption without sacrificing power and key performance parameters. One thing led to the other, and we conducted strategic trials of concrete truck mixers powered by the Mahindra BSIV-CEV MD 575 engine. The prototype gave us the confidence to build a bigger proto that was put on trial in South India for ease of control. Given the engine’s credentials, we derived confidence from the fact that it was used in tractors, and the spares would be available pan-India. The outcome of the trials was a happy set of customers. It is with this assurance, that we decided to introduce the ‘Super Six’ concrete transit mixer range powered by the Mahindra Powerol engine. Q. You launched 18 products at Excon 2017. You have followed up with a mid-year launch. What is the strategy? A. At Excon, we have been launching new products. Post the event, the sales and service teams interact with customers to assess the need gaps. Discussions often revolve around the improvement that could be carried out. There are different customer segments in India. They include proprietary concerns, big contractors, small contractors, fleet owners, and hiring companies among others. The variety of demand is thus quite diverse. Looking at the immediate requirements and addressing them is a good strategy. The Mahindra Powerol engine, being proven, gave us confidence. The operations carried out over a one year period in the market made us feel that there was no real need to stall the launch even if a mid-year launch would prove expensive. By launching mid-year, we are enabling our customers to attain six months worth of savings on fuel costs that they would otherwise have to incur. Q. How do you look at the journey of transit mixers in India? A. The transit mixers that are used in India are essentially the six designs that we have introduced, and in-line with certain geometric volume akin to a ball. Modern mixer designs are however moving from geometric volume akin to a ball, and are more elongated. The geometric volume has thus increased over-time. The water-line has increased; efficiencies have increased; internal spirals have improved, and the ingress and egress of concrete have also drastically improved. Today, the rollers are easy to access as opposed to the drums being required to be lifted earlier in order to access them. The C and C-Plus Schwing Stetter versions, for instance, are easy to maintain. These are the same mixers that are also found in developed markets like Europe, albeit in higher capacity variants. Developed markets also have variants that comply with emission norms that are equivalent of BSIV or a BSVI. They may have certain accessories that increase the overall weight of the chassis. What we have done, is to work on a light-weight version. It, however, entails higher costs with the use of thinner, high-strength steel. Lighter high-strength steel is priced in the range of 120 to 130 per kg in comparison to regular steel that costs between Rs.40 to Rs.50 per kg. To roll and weld the lighter yet high-strength steel is more challenging than regular steel. We have a variant that has been built with the use of lighter high-strength steel. We will look at an appropriate time to launch it in India. We are continuing to re-visit our products with an intention to make them better and more efficient. Our aim is to equip them with the latest technology. We are looking at six-cubic metre transit mixers since the segment constitutes 90 per cent of the business for us in the country. For such mixers, we are using a three-axle chassis. 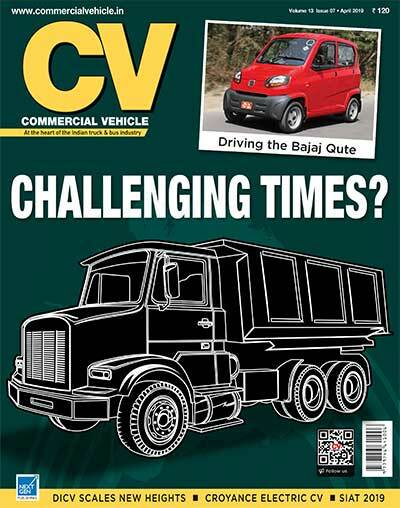 With the new notification on axles, and which leads to an increase in Gross Vehicle Weight (GVW), we will have to look at the feasibility of bringing higher capacity mixers in the future. Q. Does the new axle-load limit norms alter your light-weighting design plans? A. Yes, with higher GVW, we need not look at light-weighting for now. Q. How do you look at the new axle norms influencing your design strategy? A. The notification, to be frank, came as a shock to us. The GVW has been increased by a significant margin. The 25-tonnes axle load limit has increased to 28.5-tonnes. This marks an increase of more than 10 per cent. The new tolerance levels additionally allow for five per cent loading beyond the set limits. In effect, the earlier load limit of 25-tonnes goes up to more than 30-tonnes, marking an increase of roughly 20 per cent in GVW terms. With the new limits, a six-cubic metre mixer could be straightaway replaced by a seven-cubic metre mixer. There’s really no need to go for a light-weight mixer. The notification came as a surprise to us as nowhere in the world are such high GVW levels permitted on a three-axle chassis. From another perspective, it could be that the RTO is looking at becoming more strict and stringent when it comes to enforcing the regulations, starting with the new legitimate load limits. The quality of our roads has improved from what it was in the past. The payload might, however, come down when BSVI emission norms are attained. 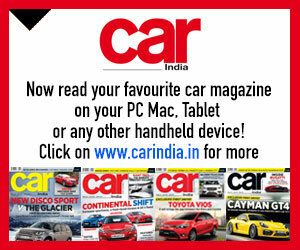 The related accessories would require manufacturers to factor in a weight of about 300 odd kgs. Q. What is your growth outlook for the construction equipment industry? A. The construction equipment industry is doing quite well. Since the second half of 2015, growth has been driven by road contracts, metro-rail contracts, and airport contracts among other infrastructure projects. In every project that involves the use of concrete, we stand to benefit. It will need to be seen how much thrust the government continues to apply to infrastructure development. How quickly it clears the bottlenecks, devises new policies for the impact to be visible. With the whole lot of new contracts already awarded, we expect the construction equipment industry to stay at current levels by a conservative estimate.